Councillors had a crash course in internet connectivity yesterday afternoon, as plans for a novel method of improving internet connectivity were explained. £60m of funding is being sought for a plan that could see the north wales local authorities install, own and manage the ducting that fibre cables sit in rather than a more traditional installation that sees commercial companies duct, own and operate the service. Members of the Employment, Business and Investment Scrutiny Committee were meant to be examining the North Wales Digital Connectivity Strategy, however the meeting appeared to be more of a tee up for future learning for councillors on the topic of internet connectivity and related systems. Councillors had been presented with a copy of the Strategy itself, credited to GreySky Consulting which is headed up by James Saunby a former high level BT broadband guru along with the formal meeting report. The Strategy had come out of the North Wales Growth Board earlier this year, and will be part of creating a detailed action plan and development of a bid to the UK Government’s Local Full Fibre Network Fund. Councillors were told how that fits in with the current North Wales Growth Bid, and overall aspirations from all of the north wales councils working together to acquire joint funding for large scale projects such as this. The overall Growth Bid is worth hundreds of millions of pounds, and would flow from UK Government via a decision at that Autumn Statement by the Chancellor the Exchequer – Philip Hammond MP, who had links to Wrexham via Castlemead Homes. Despite the overall document being one of a wider strategy councillors took the chance to explain their constituents, and personal, internet connectivity woes. Wrexham Council’s Chief Economic Development Officer Steve Bailey explained that it was likely a faster cabled connection was possible if the councillor was willing to pay, adding that mobile connections themselves require base stations that have fast internet connections to feed out, “You need to improve the passive hard infrastructure, to be ready to improve to 5G anyway. Investment in 5G is with the providers, and it not something we can do anything about. The best thing we can do is make us readily available for that investment. The Officer added that the main ‘turn offs’ are planning issues and that such issues effectively needs to be sucked up as there there will be longer term benefits for peoples lives as a result. 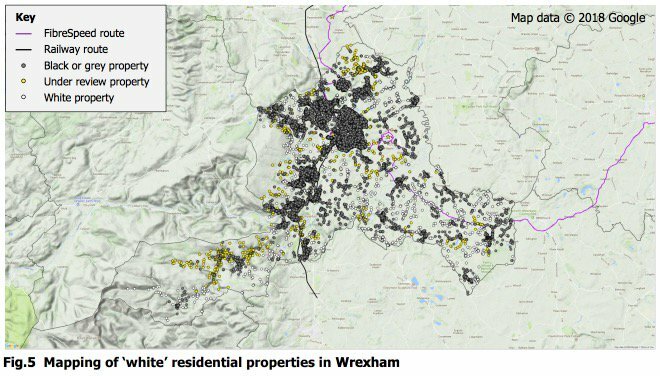 Recently Wrexham have seen the mess left when Virgin installed connectivity around town, and often new mobile masts are debated at planning with negative connotations. Cllr John Pritchard thanked the Officer for the ‘very good information’, noting he hears a range of complaints over connectivity but mainly from rural areas. Cllr Pritchard indicated he wished to be the conduit for the correct information to pass on to people with issues however was unclear on some of the technical issues, as some defied logic. One example was of a resident a few hundred meters away from the exchange but struggling to get connected without a vast fee. Broadband for the Rural North or ‘B4RN’ (website here) was referenced as a possible method of helping roll out broadband to rural or awkward areas, with £100 a metre fibre costs quoted, whereas ‘if you dig your own hole’ that can come down to £5 a meter. Cllr Dana Davies pointed to the BT Openreach ‘Community Fibre’ project where various grants and cofunding is possible to get connectivity to similar areas. 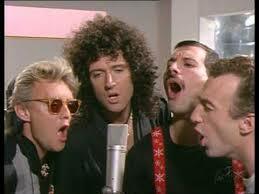 The Officer explained that such schemes are being looked at, if not those specific providers, as part of the plans and that the UK Government’s Department for Digital, Culture, Media & Sport were ‘keen’ on such collaborate and community approaches. 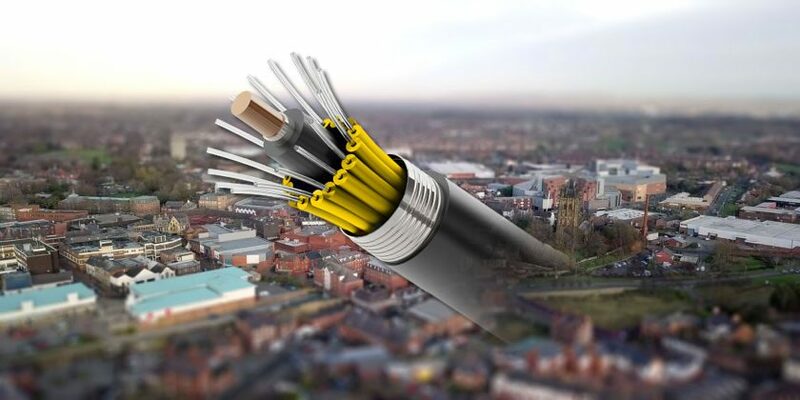 Speaking about other plans it emerged that Wrexham Council, along with other local authorities, would look to introduce their own fibre ducting and expand what is already there. This would mean many miles of ducts through north wales with the relevant fibre cabling inside – owned and maintained by the local authorities themselves. The example was given that current costs could mean a several hundred pound a month bill for fibre to a company could be reduced to nearer one hundred pounds. At this point a presentation was given along with a quick quiz to get councillors thinking about connectivity and what it really means. Questions included the total internet traffic in 1992, and comparisons to 2018 and future predictions. Councillors were also asked if any had a 4K brand new television (none indicated they did) as it was explained the extra bandwidth required to stream and watch video on them via the internet. Other examples were given for reasons why such new infrastructure is required, with the more obvious examples including health professionals working remotely. The concept of the ‘Internet of Things’ appeared new ground for many in the room, with the days of your door locks telling you they are infact closed, if your car park space at work is empty, your toaster talks to your fridge to check how much butter you have sounding like sci-fi. Wrexham Council’s Executive Director for Place and Economy Lee Robinson also later gave an example of connectivity use to the meeting that revolved around tourism, explaining a scenario where tourists in a B&B could try and search for activities online with no connection, can’t book tickets or research activities for rainy days, adding the connectivity project makes ‘significant small differences in many areas’. Slide including ‘threats’ of not proceeding included a warning of a ‘digital divide’, those with connectivity and those without. Research already shows a base with or without connectivity creates inequality, but there is evidence that inequality can result from slower bandwith. Councillors were also shown a graphical representation of download speeds, although we cant locate the exact example it was similar to this, showing the difference between slow connections and super fast ones. The presentation went on to explain ‘key interventions’ that included a suggestion that Wrexham Council could look at making broadband a component of their social housing stock. The cost of the plans were given as an overall £60m assuming ‘everything came together’, meaning the Growth Bid , a UK Government funded bid and other elements. Timescales to submit the bids appear tight, with one due as soon as next friday. After the presentation councillors asked further questions revolving around what they had seen. The Officer pointed out that “99.999% of infrastructure is public built, and hope that the private sector will use it”. Cllr Micheal Dixon gave his experienced viewpoint, recalling how the Post Office used to complain about the ‘final mile’ of telephone system not being used enough, and now it is the most used, adding that BT were moving towards to an entirely IP based network. Cllr Skelland reasked about timescales, with Cllr Mark Pritchard responding to him taking issue with apparent criticism of being ‘too aspirational’, saying ‘We should reach to the skies!’. The overall meeting appeared to be informative to those present and taking that theme forward the committee formed up a resolution to recommend a workshop for all 52 councillors to hear from the consultants who had put the report for them together. In reference to another meeting of councillors, of unknown topic or location where connectivity and the Growth Bid had obviously been discussed, a ‘confusion’ over such topics was referred to. With a comment of ‘that is trying to be kind’ it appears such a session will be genuinely useful to those who attend. Cllr Davies also added a recommendation that the action plan output and risk assessments will also come back to the committee as and when they are available. The committee will likely revisit the topic once the Autumn Statement funding decision has been made, and either the grand plans for the connectivity project get the green light, or are scuppered in Westminster. Meeting wrapping up – appears has been a learning session for a few councillors on broadband/internety stuff, and the committee is keen for the other councillors to benefit from similar so an all member workshop is being sorted out. Hopefully well attended! Lots riding on the North Wales Growth Bid it seems not just on connectivity plans but other projects. Decision will come likely November-ish in Autumn Statement from UK Gov. With lots of talk of superfast broadband, Cllr Skelland says broadband locally on the industrial estate is not ‘super dooper’ , someone enquires if that is a technical term! @wrexham I, for one, can’t wait until my cat flap starts a cyber attack on toasters in Chester. Wrexham Council joins the future, the Internet of Things gets first mention we can remember! Councillors learning about how their cat flaps could be talking to the internet as well as fridges and cookers etc, now visual demo of what slow connections look like. No councillors on this committee have a 4K telly. Info comes as an interesting mini internet test for them from Officer to explain speeds, where internet use is going and thus need for fibre and fast internet for people / business. @wrexham Village on the news last week installed their own. Farmers dug trench etc then villagers connected it all up. The speeds were quoted as been one of the fastest in the world. Interesting debate aside from report on how broadband can be rolled out rurally. £100-a-metre cost for fibre quoted, a community service in Yorkshire referred to does it for a fiver….if you dig your own trenches! Cllr Skelland says his 4G connection is 4x faster than his cable broadband connection. What do people use? Is investment in cabled internet provision turning old hat? If you are quite warm in this heatwave, take an interest in local democracy. Meeting Room 1 in the Guildhall is lovely and cool with aircon this afternoon as Cllrs look to discuss a connectivity report!